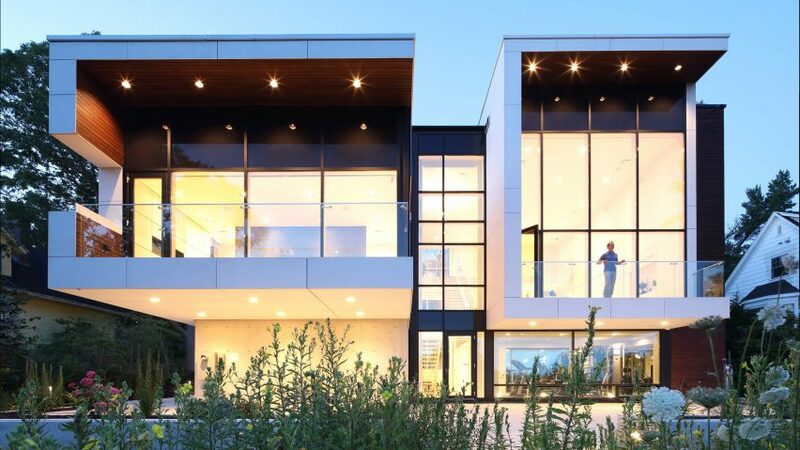 Halifax-based Omar Gandhi Architect has built a three-storey home in the city, featuring two white-clad volumes with a double-height space sandwiched in the middle. Syncline is located in the south end of Halifax, Nova Scotia, and sits adjacent to Point Pleasant Park with views overlooking the city's Northwest Arm inlet. The residence is named after a syncline – a fold in stratified rock with younger layers closer to the centre – because it rests on one of these features running through the Canadian city. Designed for a couple with mixed Californian and Nova Scotian roots, the home has a "quiet, masculine modern form" according to Omar Gandhi Architect. The house comprises two different-sized white volumes that are offset from one another and placed atop a concrete base. The pair is clad in German-made fibre-cement panels made from raw materials like sand, glass fibres and cement. "The volumes vary in proportion as well as location, with one lunging forward slightly ahead of the other," said the studio. A central glazed core with black frames links the two structures. On the side of the taller, narrower volume, an elevator is housed in a structure made from locally sourced spruce, which is scorched to be decay- and flame-resistant. Inside the concrete base on the ground floor is a two-car garage, a gym, a media room and a bathroom. An open-plan kitchen, dining and living space are situated in the narrow volume on the level above. In the wider unit is a master bedroom, walk-in closet, and en-suite bathroom. This volume also has an office and a laundry room situated towards the front, more private section of the house. Both volumes have large, overhanging decks with ocean views. A white steel staircase is centred in the glazed atrium, and leads up to a small mezzanine with a guest bedroom and bathroom. White walls and cabinetry, and wide white oak flooring create a light interior palette overall. Decor is contemporary and minimal, and the expansive floor-to-ceiling windows and industrial staircase make the interior seem rather exposed. The structure also has a rooftop deck with a hot tub and photovoltaic panels. A geothermal heat pumps is the primary source for heating and cooling, with triple-pane glazing, automated blinds and recessed windows on the southwest side to help passively cool the house further. Omar Gandhi Architect has recently completed a few homes in and around Halifax, including a coastal holiday residence clad in cedar, a modest wood cabin with an aluminium roof, and a black house in made up of stacked cuboids.